Going beyond simple ‘design practice’ and implementing a navigational framework that adapts itself to the changes within the building of STPLN. This is what the student group for STPLN, an open house for people with creative ideas/projects based in Malmö, set out to do. By implementing various creative ideas within the various spaces of building, the group managed to bring together the various users and actors of STPLN, as well as making the building more inviting for new users. For the course Design for Social Innovation, Dennis Bücker, Judit Komáromi and Lisa Rausch from the K3 Interaction Design Master program carried out a two-month project in collaboration with STPLN. For their project, the group had the challenging task to make the space of STPLN more intuitive to navigate for new as well as recurring users of the building alike, and to showcase the different resources available in the different parts of the building, all by using visual tools. To benefit the Swedish community of Lindängen by working together with them. This was what the project-group In Lindängen with Lindängen set out to do, and succeeded in. By working within, and most importantly wíth the community, the group explored how to support and further reinforce existing and possible collaborations between different actors and citizens in Lindängen. For the course Design for Social Innovation, Ana Barbosa, Erica Coria, Hannah Weiser and Mauricio Struckel from the K3 Interaction Design Master program carried out a social innovation project in the Swedish community of Lindängen. The project , called ‘In Lindängen with Lindängen’, has been carried out in collaboration with Framtidens Hus (Future House), a citizen service provided by the Malmö Municipality . Starting from the concern of how to move beyond the time-limited frame of project formats, they developed a time-line and a map to share information about previous and ongoing projects in Lindängen, moreover, they also constructed a public oven together with local people in Lindängen. By conducting an interview with the group, I managed to gain more information about how the implementation of ‘the oven’ realized their goals, what the future holds for their project after they left Lindängen, and how their project reinforced collaborations between the community of Lindängen and the various actors involved. Graphic Design have been trying out Malmö University’s new innovation hub Storm. Last week they worked with a project for the upcoming conference Vattendagen 2017. The students presented their ideas to representatives from Länsstyrelsen Skåne/The Country Administrative board of Skåne and Handelskammaren Skåne/Chamber of Commerce and Industry of Southern Sweden. Malmö University will inaugurate the new innovation hub Storm April 27th. 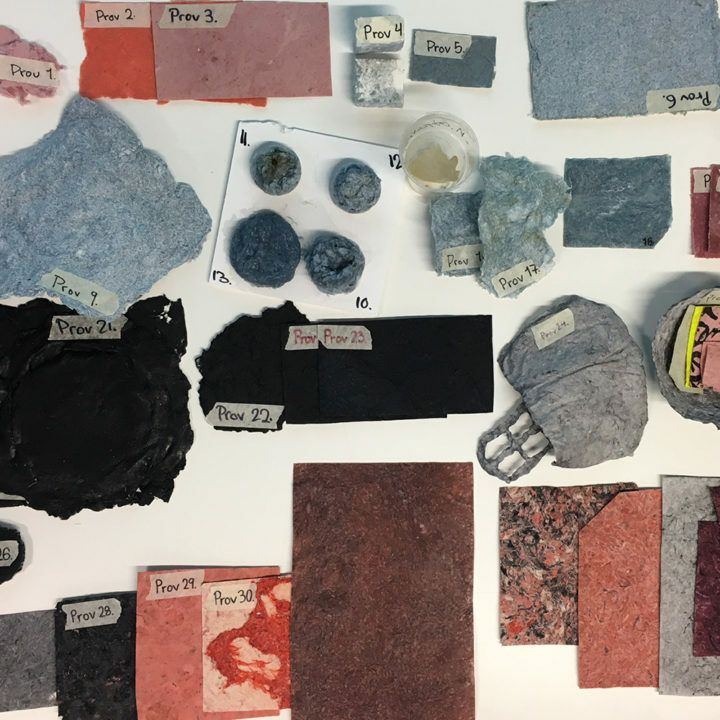 Product Design students have been developing new sustainable and resource-efficient materials and the result is now an exhibition at Form/Design Center in Malmö. The exhibition will continue to March 26th. Next week Friday, 3 February, you are welcome to join the ComDev team for a screening of the documentary We Want To Live – Liberia’s Fight Against Ebola followed by a discussion with Executive Producer Antje Boehmert. “WE WANT YOU TO LIVE – Liberia’s fight against Ebola” is a documentary about the devastation the Ebola outbreak has brought upon Liberia. How do people experience an epidemic that was out of control for months, that destroyed the country’s health system and left fear and mistrust in cities and villages? WE WANT YOU TO LIVE – Liberia’s fight against Ebola tells the story of Stanley Juah, a father of four who, through one of his sons, brought the virus to his village and who is now held accountable for the deaths of fourteen people. Stanley’s last hope rests with a Reverend who tries to seek the community’s forgiveness on his behalf. There are health workers such as the nurse Mabel Musa who struggle in the face of this biblical task. After thousands who have perished, Mabel realizes how her country and her people are starting to surrender to this epidemic. The panel after the screening will discuss ethical questions of crisis journalism, documentary film-making best practices as well as the collaboration between the project and the Pulitzer Center for Crisis Reporting, exploring new forms of story-telling and financing. The screening of the 55-minute documentary will start at 14:00 sharp and we have time for Q&As and discussion until 16:30. P4 Malmöhus/Radio Sweden interviewed students at the inauguration of Mitt formspråk by Product Design. The exhibition is open until January 29 at Form/Design Center, Malmö. Students from Visual Communication year 2 have worked with adaptation of fairy tales during autumn semester in the course Genrer, texter och medieutbud/Genre, Text and Media. Welcome to the inauguration of Mitt formspråk by Product Design students (year 1) next week at Form Design Center, January 18 16-18. On Friday Interaction Design students (year 2) showed their projects from the course Tangible and Embodied Interaction. Graphic Design students have during autumn semester been assigned to form groups and work as media agency with Försvarsmakten/the Swedish Armed Forces as customer. The students presented their work for representatives from the Swedish Armed Forces earlier this week. Read more about the collaboration at Malmö University webpage.